Fresh Fig, Buttered Onion and Brie? 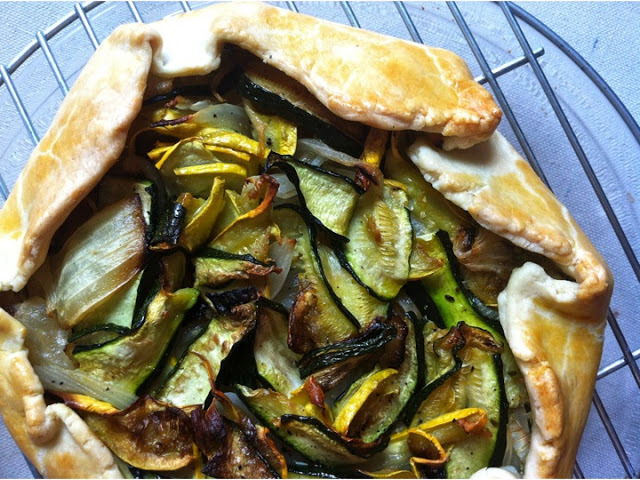 Well, the tart dough was so silly easy that I decided to use my CSA influx of summer squash (better known as zucchini) and lush herbs in yet another tart. This one turned out just as marvelous as the first two, leading me to the obvious conclusion that anything stuffed into a flaky, buttery crust will delight the belly and fill the soul (and those of your fellow eaters). This time I used my food processor to blend the flour and butter into a coarse, sandy-like texture. It was so much faster, but have no fear, the dough turned out just as good as the hand method (see both in the instructions). I also brushed the tart with an egg wash this time – the dough was even more delicious and beautiful. This is an easy improvement! Thank you The Kitchen Sink Recipes for your inspiration, and Shanti of Shantilly Picnic (the flaky tart expert) for your advice! Using a sharp knife, or pastry cutter, cut in the butter in small flakes, mixing occasionally to coat the butter with flour. When you've finished the butter, use your fingers to break up the butter and mix it into the flour until the flour is a cornmeal-like mixture, or like chunky sand. (If you have a food processor, put the flour and tablespoon-size chunks of butter in the food processor, and pulse until you have a cornmeal-like consistency). Add one tablespoon of ice water at a time, mixing with a spoon. Stop when the mixture just comes together. Less water is better. Though it will seem flaky, knead the dough in the bowl with your hands about 5 times to form a ball. Divide the ball into four pieces and put the bowl in the refrigerator. Lay out a large sheet of plastic wrap (about 12 inches by 12 inches) on the counter, and transfer one section of dough to the center of the plastic wrap, leaving the remaining dough in the refrigerator. Without kneading, use your hands to mold the dough into a ball. It shouldn't be perfect. 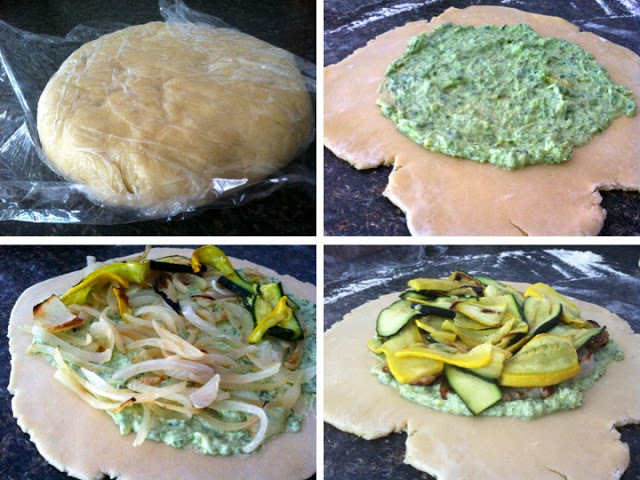 Place another sheet of plastic wrap on top of the dough. Using the roll of plastic wrap, or a rolling pin, roll out the dough into a circle about 1/4 inch think. 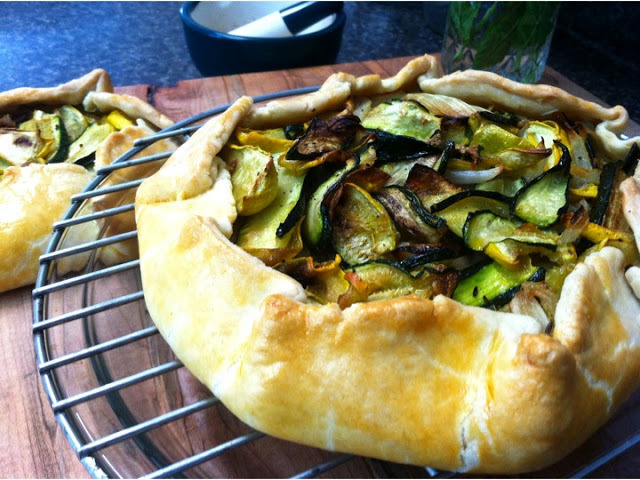 This is a rustic tart - the circle won't be perfectly rounded. Put the plastic wrap-sandwiched circle in the refrigerator, laid flat. Once you've finished with the dough, preheat the oven to 350 and pay attention to your fillings. Grease two baking sheets with butter, or line with parchment paper. Put all of the ingredients, except the salt and water, to a blender. Whirl into a puree. Add water or more lemon juice to thin the consistency if it is too thick and the blender won't move. (Although olive oil is a liquid, adding more will only thicken the mixture, as olive oil "emulsifies" - thickens). Taste the pesto to see if it needs more salt. 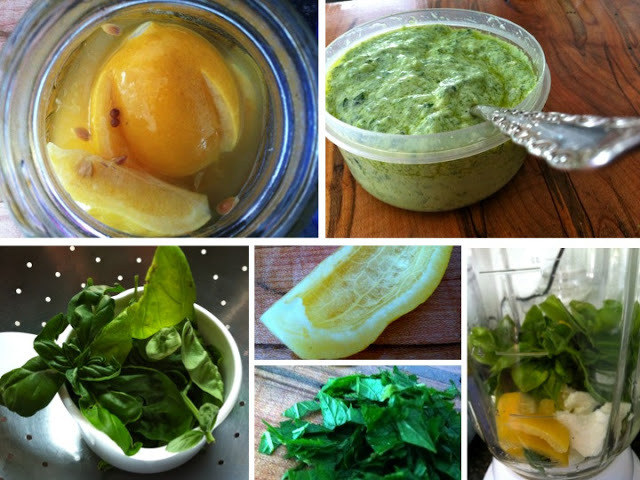 This will vary depending on the goat cheese you purchased or whether you used a preserved lemon. Transfer the pesto from the blender to a small jar and store in the refrigerator until you are ready to assemble your tart. 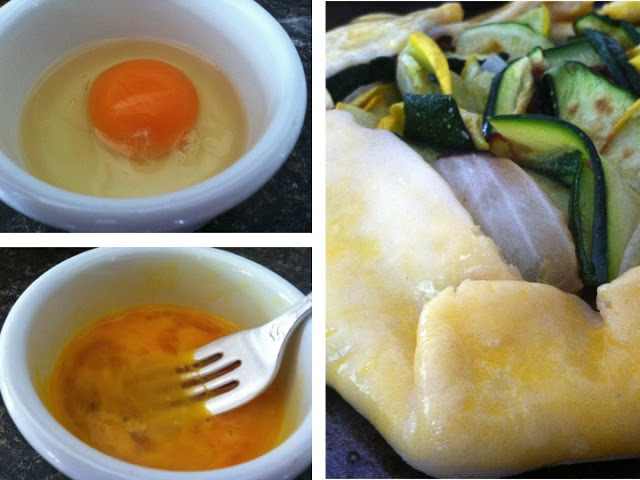 Note: If you do not have a blender, you can still make this! Chop everything very finely, and mix thoroughly in a bowl with a fork. Note: Extra pesto will keep in the refrigerator for up to one week. Use it for dipping raw vegetables, cooking eggs, and tossing extra olive oil for a salad dressing. 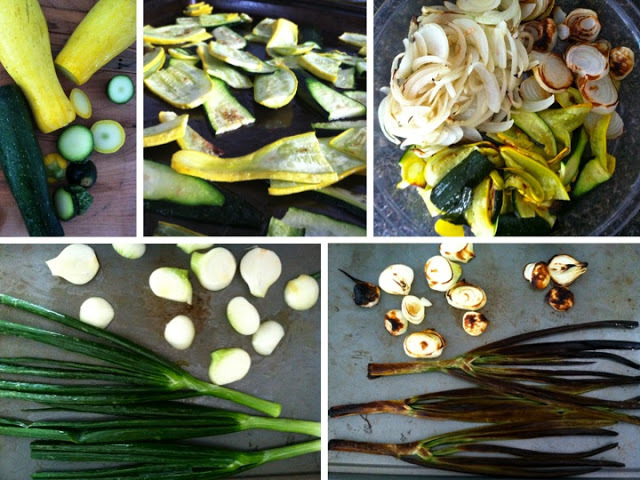 Toss the zucchini with olive oil so that the zucchini is thoroughly coated. Spread evenly on a baking sheet. Repeat with the onions, and spread evenly on a separate baking sheet. 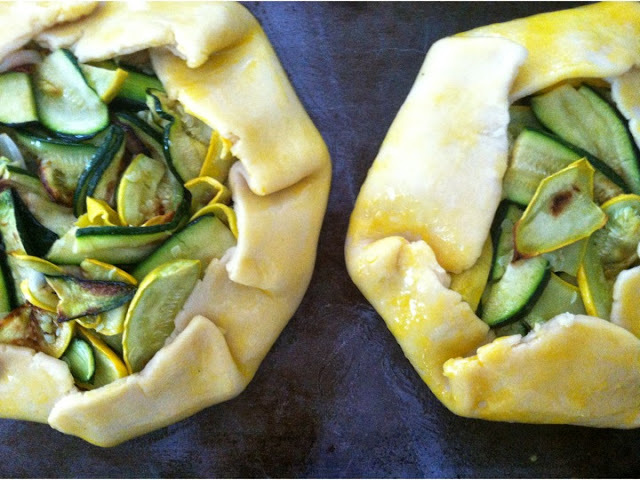 Place the zucchini and onions in the oven for about 30 minutes, or until the vegetables are browned. Keep a close eye on the spring onions - the greens will burn before the bulb of the onion is ready. You can remove them from the baking sheet early and chop coarsely while you are waiting for the rest of the vegetables to finish. Remove one of the dough circles from the refrigerator. Spread an even and generous layer of pesto goat cheese on the dough circle. Top with an even layer of onions, followed by an even layer of zucchini. Fold up the edges of the tarts, pinching together the dough every 2 inches or so to create pleats, like a skirt. This will cradle the filling and close the dough around the tart more securely, and rustically adorn the edges. Place the tarts on a baking sheet. Bake for about 45 minutes, or until the dough is golden brown.